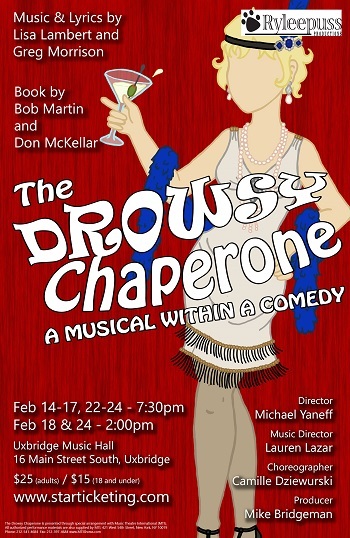 Ryleepuss Productions proudly presents The Drowsy Chaperone. Bursting with show-stopping song and dance - this Canadian musical parody & five-time Tony Award winner whisks audiences away on a Jazz Age journey of love, laughter, and libation. Alone in his modest, one-bedroom apartment, a musical theatre fan puts on his favourite cast recording. As the record spins, the colourful & chaotic characters of a fictitious 1928 musical spring to life – filling his living room with all manner of movie stars, gangsters, divas, and more. All ticket prices are: $25.00 Adults, $22.00 Seniors, $16.00 Students and include taxes, ticket fees and Music Hall Improvement Fund. Valentine's Special: 2 tickets for $35.00 including taxes, ticket fees and Music Hall Improvement Fund. Special ticket prices of: $20.00 Adults, $18.00 Seniors, and $13.00 for Students including taxes, ticket fees and Music Hall Improvement Fund for tickets purchased for this show before December 31st, 2017.